Exam Board: AQA Level: GCSE Grade 9-1 Subject: English Literature First Teaching: September 2015, First Exams: June 2017 Everything you need to score top marks on your GCSE Grade 9-1 English Literature exam is right at your fingertips! 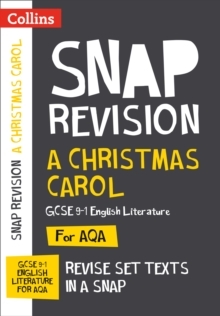 Revise A Christmas Carol by Charles Dickens in a snap with this new GCSE Grade 9-1 Snap Revision Text Guide from Collins. For more revision on Charles Dickens, check out our Snap Revision Text Guide on Great Expectations (9780008306656).